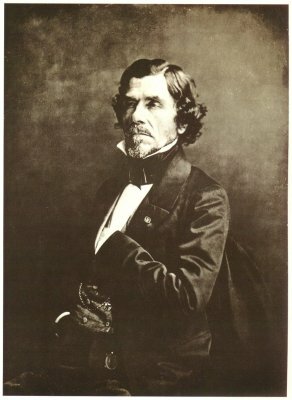 Ferdinand-Victor-Eugene Delacroix (1798-1863) was one the greatest of the French romantic painters of the first half of the 19th century, and a lifelong friend of Alexandre Dumas. Like Dumas, Delacroix was a outspoken republican and a participant in the July (1830) revolution, which Delacroix commemorated in his painting "Liberty Leading the People." (In this painting, Delacroix added himself to the picture--on the left, wearing a top hat). In 1838, Delacroix traveled to North Africa, and made a series of now famous paintings. In Dumas' travel book Tangier a Tunis, he recounts "I suddenly recalled a lovely painting of a Jewess that I had seen in the study of Delacroix after his return from Morocco, and I thought what a treat it would be to my companions to have a similar model." Dumas recounts how he found the woman whom Delacroix painted, now a young matron, and persuaded her to pose for his artist-traveling companion, Louis Boulanger. Dumas biographer F. W. J. Hemmings indicates that Dumas owned at least two paintings by Delacroix, "Hamlet and Horatio in the Graveyard", and "Tasso," which hung in the Chateau Monte Cristo, and which he was able to take to Belgium with him in 1851. The Hamlet painting must have been especially close to Dumas' heart, since Dumas translated and adapted Hamlet for the French stage.